Sometimes your specific website design or content, or your customization needs will require that you entirely rework small or large parts of the HTML or CSS output of weeblrAMP built-in theme. Most importantly, you can override any of these layouts files by your own, simply by placing your version in a specific folder inside your theme, or better, inside a child theme. 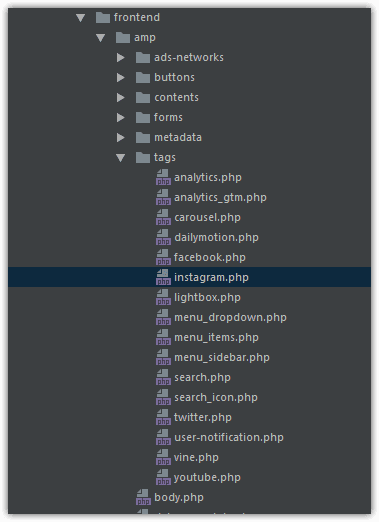 That's it: this new instagram.php file is the template weeblrAMP will now use instead of its own to display Instagram images. Changes made to this file will be propagated to any situations where an Instagram image is shown. This was just an example of course. As you can see on previous screenshots, there are many layouts files, and you only need to pick the ones you need for your customization. 'single-' followed by the "slug" of a custom post type will apply to all posts of that type. This allow pretty extensive, yet granular customization of all your AMP content. 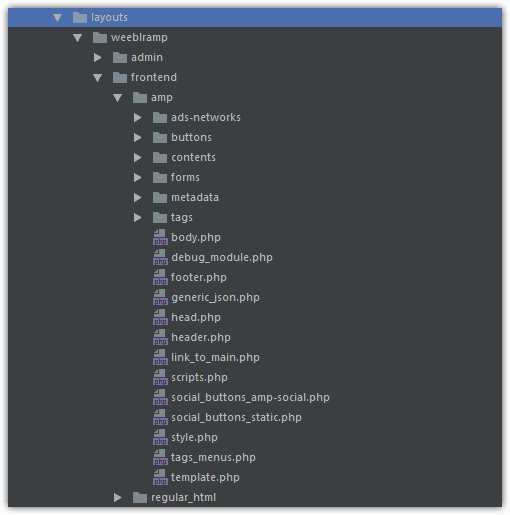 Though for clarity we tend to prefer the use of layouts override in files, as described above, you do not have to put your overrides in separate files, using the same folder hierarchy as the originals. You can use filters instead. 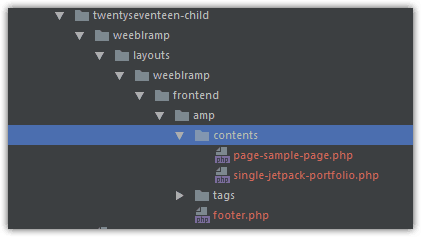 weeblrAMP will automatically pick-up layouts files you place in your theme or child theme, in the appropriate folder. But you can also store those overrides in other locations, as long as you inform weeblrAMP that these overrides are available. This is done very simply, using the weeblramp_template_dir filter. 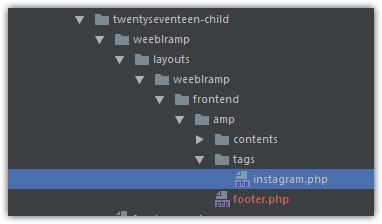 Use this filter to register the root path where you have stored all your additional layouts, and weeblrAMP will check it before using a layout, looking for an override you may have created there. This is very convenient to package what we could call an AMP theme. This is what we did to build our WooCommerce theme, which packs a set of layouts, that replaces the default built-in posts and categories layouts with some suited for WooCommerce products.